You might not see their records in the charts, but these artists are all leading lights in their particular genre. Jeremy Sassoon’s Ray Charles Project is a 17-piece tribute to the music of Ray Charles Their show on 6 September features Ray’s all-time classics, and has headlined sold-out shows at Ronnie Scott’s Jazz Club and at Camden’s Jazz Café. You can hear more jazz at Songbook Sundays, when The Chris Ingham Trio are joined by special guests, including Joanna Eden on 25 September and Emily Dankworth on 23 October. On 15 November, Billy Bragg will be joined by Joe Henry to play classic railroad songs from their recent American train journey, along with favourites from their own back catalogues. Expect a relaxed atmosphere and plenty of humour on 22 September, as Graham Parker – with the aid of Brinsley Schwarz’s virtuoso musicianship – reinvents his prodigious catalogue from Graham Parker and The Rumour to his solo career. There are two rising stars of the blues rock world; guitar prodigy Chantel McGregor, who has won five British Blues Awards in the last three years, including Guitarist of the Year in 2013 & 2014, plays on 8 September, while Joanne Shaw Taylor, whose famous fans include Joe Bonamassa, Wilko Johnson and John Mayall, will be joined by Aaron Keylock on 5 November. Lulo Reinhardt comes from a long lineage of highly talented musicians; on 21 September, he is joined by Andre Krengel, for Latin and Gypsy inspired guitar music. Jairo Barrull Flamenco Company present a new show on 2 October - ‘Gitano’, with special guest Gema Moneo, will feature all the core styles of Gypsy flamenco dance. Evoking vivid images of fiddle maestros and campfires, Budapest Café Orchestra play traditional folk and Gypsy flavoured music from the Balkans and Russia, including beautiful ballads, such as the theme to Schindler's List and Waltz Lacrimoso on 6 October. Fusing West African rhythms, Irish traditional music and cutting-edge dance grooves, Afro Celt Sound System’s cross-cultural collaboration includes founder member Simon Emmerson (producer, guitars, cittern) and long-term members, vocalist, kora and balafon player N’Faly Kouyaté and Dhol drummer Johnny Kalsi. Enjoy one of their acclaimed live performances on 26 October. BBC World Music Award winner, Chango Spasiuk is a fiery and sensitive accordion virtuoso with a charismatic stage presence. On 14 November he brings his warm-hearted Argentinian deep swing music, which taps into native Guarani, Spanish, Criollo and Eastern European roots. Folk fans can enjoy seeing some of the genre’s best contemporary artists. Eliza Carthy returns on 3 November with The Wayward Band - bursting with some of the finest new wave of folk musicians. Jon Boden, best known for being the lead singer of the progressive folk juggernaut Bellowhead, appears solo on 20 November. Turin Brakes bring their lush, melodic, folk-inflected rock on 7 December, while The Demon Barbers extend an invitation to the folk and hip hop party of the year at The Lock In ‘Christmas Carol’ on 28 November. There will be two classical quartets in autumn. The Allegri Quartet is Britain’s oldest chamber music group, and is renowned for its key role on the British musical scene; its current line up continues to attract glowing reviews and their concert on 16 October features works by Mozart, Roth and Ravel. The Belcea Quartet on 12 December have a programme of Schubert and Shostakovich. 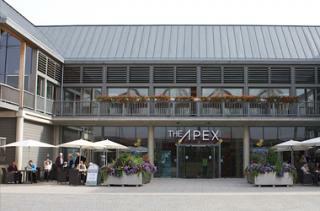 For more information, or to book your tickets, call the Box Office on 01284 758000, or visit www.theapex.co.uk.